This is an easy dish to prepare, it tastes amazing AND can be made ahead of time (it actually tastes better!). I’ve been making this for a couple of years now – it’s become a family favorite! I created it out of necessity. We used to have Burrito Night which consisted of everyone making their own burritos (which required many bowls for all the toppings). Then after the burritos were made, we would have my youngest attempting to eat his burrito without it completely falling apart. Haha. Never happened. Mess!!! It would wind up that I would spend an hour cleaning up after dinner to put everything away, rinse all the bowls, etc. and attempting to remove burrito fixin’s from clothes! There had to be an easier way! 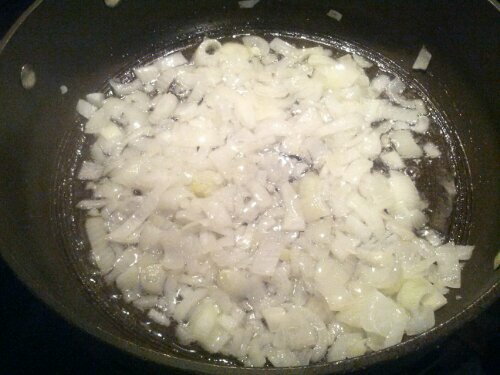 I start by sauteing a cup of chopped onions in vegetable oil. When they’re just about tender, I add about a teaspoon of minced garlic and the ground meat (I use ground pork). When the meat is cooked, I add taco seasoning and water (whatever amount the taco seasoning packet says). 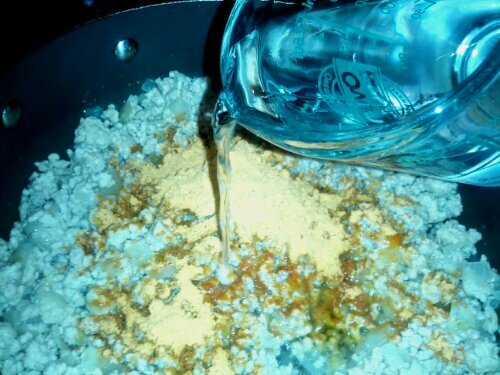 You could easily make your own taco seasoning if you prefer (just make sure you add about 2/3 cup of water so the meat can stew in it for 5 minutes). Now the fun part… Assembly! OK here we go! 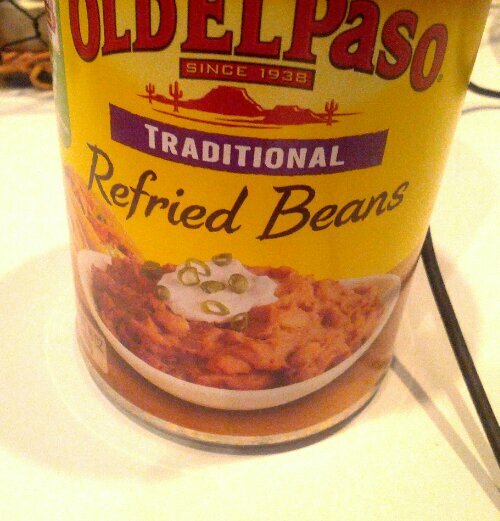 Open your can of refried beans! 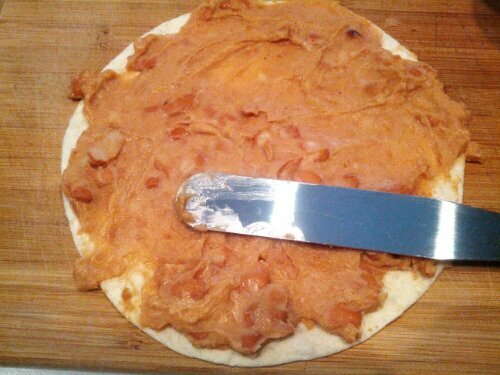 Now, using a wide knife or spatula (I use my icing spreader), spread a layer of the refried beans on a 10″ flour tortilla. Spread it fairly thin but cover as much as you can. Place the tortilla in the casserole dish (bean side up!) (mine is a 2 1/2 quart square-ish casserole dish and the 10″ tortillas fit just about perfectly). Next layer some of the ground meat mixture on top of the beans (make it fairly thin – you need to spread the meat on 4 layers). Spoon some salsa on top of the meat – just a couple spoons here and there. Sprinkle cheese on top of that. One layer is complete! After you finish the layers, you can refrigerate if you want to. At this point I prepare my lettuce. 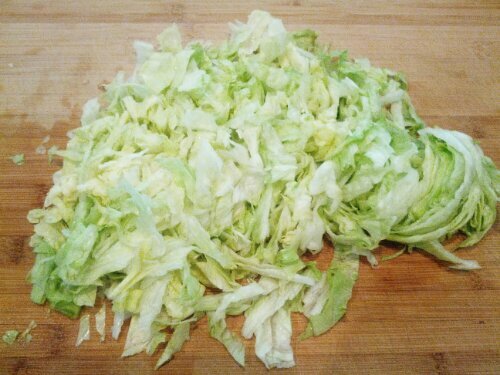 I use a regular head of iceberg lettuce and shred it myself because I never have luck with those bags of lettuce lasting! I put this in the refrigerator to chill until I’m ready for it. When you’re ready to cook it, preheat the oven to 350°. Put the ‘lasagna’ in the oven, covered. Bake for about 30 minutes (10 minutes less if you’re cooking it right away) then remove the lid and bake another 10 minutes (mixture should be bubbly around edges when ready). 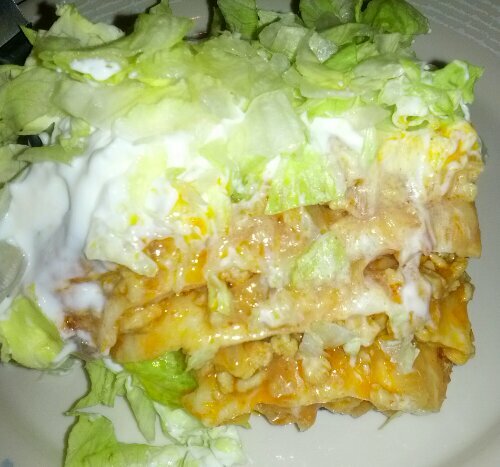 Now take your sour cream and layer it on top of your ‘lasagna’ – about 2 cups spread out. Approx. 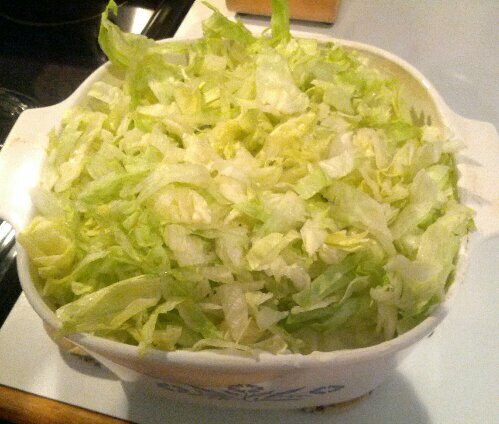 2 cups shredded lettuce. Saute onions, add garlic, add ground pork. When meat is cooked thoroughly, add taco seasoning and water (water amount according to taco seasoning instructions). Let simmer for 5 minutes. Spread refried beans on flour tortilla. Place in greased 2 1/2 quart casserole dish. Layer about a cup of the meat mixture on top of the beans. Spoon a couple tablespoons of salsa on top of the meat. 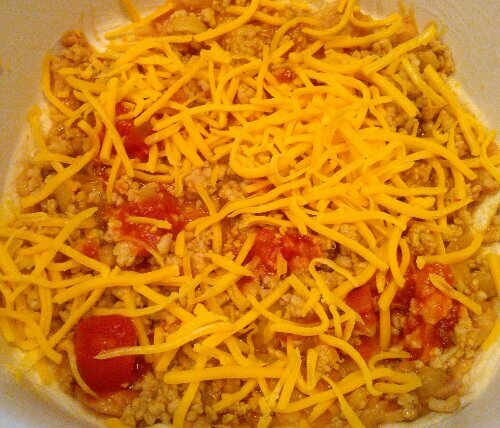 Sprinkle about 1/2 cup of shredded cheese on top of the meat and salsa. Repeat 3 more times. Bake in preheated 350° oven for 30 minutes (covered). Remove cover. Bake an additional 10 minutes, until edges are bubbly. Remove from oven & let cool for 5 minutes. 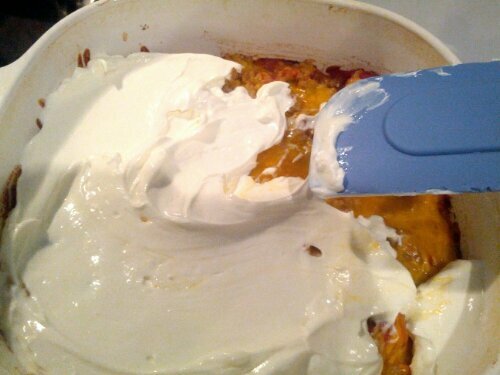 After it has cooled, spread a layer of sour cream (2 cups) on top of the casserole, then 2 cups of shredded lettuce on top of the sour cream.